So a few days ago, it was announced that Hostess was going out of business. Stock up on your Twinkies as you get ready for the apocalypse. 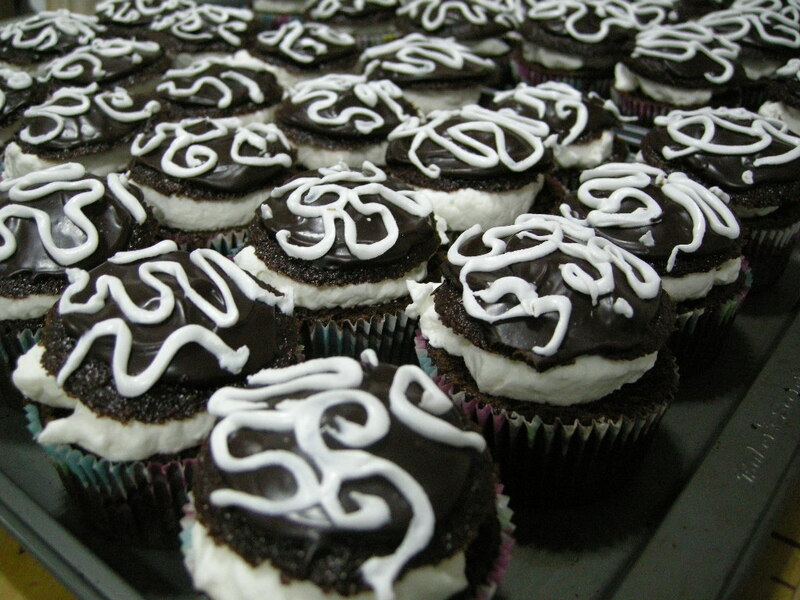 Hostess also made those chocolate cupcakes with the signature loop design. So, to honour the dearly departed Hostesss, I thought I’d post my version of the Hostess cupcakes that I did a few years ago. First of all for the cake part, I use my go to chocolate cake recipe. I doubled the recipe to make 48 cupcakes (I have lots of mouths to feed!). Variation to the measurement time: Fill the cupcake wells ¾ of the way so that when they rise, it’ll give you plenty of cupcake top to cut off. Bake the cupcakes for 20 minutes. When cupcakes are cooled, use a serrated knife to cut the tops off. Create chocolate ganache: Place 1 cup semi-sweet chocolate chip into a heatproof bowl. Heat ¾ cup of whipping cream until it just starts to boil. Remove from heat and pour over the chocolate. Let chocolate melt and then stir with a whisk until ganache is smooth. Spread ganache on top of the cupcake tops. Refrigerate so the ganache can firm up. Meanwhile, make the frosting glaze: Mix 1 cup icing sugar with 2 tbsp. milk. Add more sugar to get a pipeable consistency. Put frosting in a pastry bag and pipe a desired design on the ganached cupcake tops. Create pastry cream: Whip 2 cups of heavy cream with ½ cup of icing sugar until soft peaks form. Dissolve 1 tsp. of gelatin in 1 tbsp. of water over a low heat. Add gelatin mixture to the cream mixture and whip until stiff peaks form. Feel free to add 1 tsp. vanilla to the mixture. Place a generous dollop of cream on top of the cut cupcakes. Now, take those pretty little cupcake lids and place them on top of the mount of pastry cream and enjoy!